John Gohorry was born Donald Smith in Coventry in 1943. He came to North Herts in 1971, and lectured in English, Communications, and Business and Management Studies at what is now North Hertfordshire College until retirement in 2006, spending the last seven years delivering Teacher Training. He has been a member of local poetry group poetry id since then, and poet in residence at David’s Bookshop since 2007. 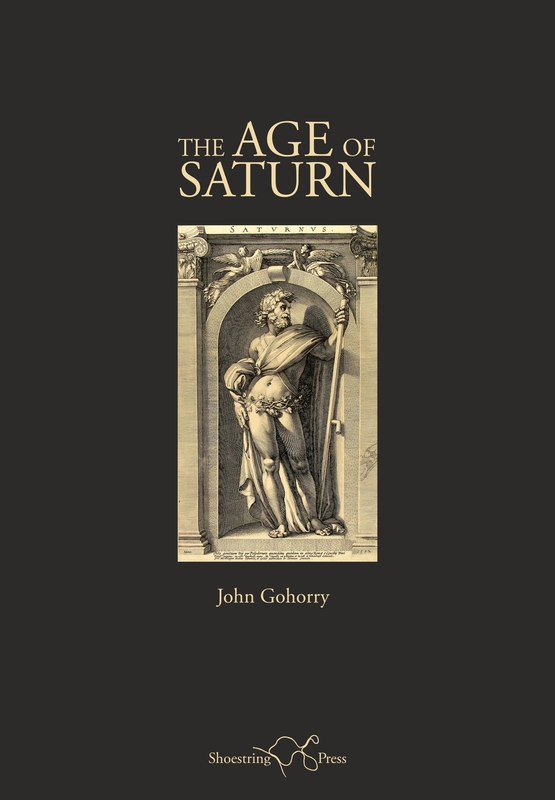 The Age of Saturn, his eighth collection, is published by Shoestring Press (2015), which also published previous collections including Imagining Magdeburg (2008), Samuel Johnson’s Amber (2010) and the long poem A Manager’s Dog (2011). “It’s a decent sized book (245 pages) containing a variety of single poems, themed groups, and sequences, some published previously in pamphlet form but most appearing for the first time. “The title sequence is a group of 34 poems consisting of an imaginary exchange of letters between the Spanish painter Goya and the German poet Hölderlin between 1819 and 1828, the year of Goya’s death. Both men were undergoing crises which were a compound of physical, emotional and psychosocial factors, both were living in relative isolation, and both responded with the full force of the imagination that each had at his disposal. Hölderlin’s engagement, through a series of short poems ostensibly written to please visitors to his room in what later became known as the Hölderlinturm in Tübingen and signed Obediently, Scardanelli, are not generally well known, but the Black Paintings which Goya executed on the walls of the Quinta del Sordo, outside Madrid and are now in the Prado, are justly famous. One of these is a painting of Saturn devouring his son, an act of cannibalism which epitomises Goya’s view of the age of Saturn and of his own time. Hölderlin on the other hand thought of it as a golden age, a time when there was no distinction between good and evil, right and wrong, no need for laws, an idyllic time when the earth gave up its harvest without the need for human labour. “Other poems in the collection touch, directly or indirectly, on one or other of these conflicting perspectives – a series of poems based on paintings by Jack Vettriano, several biographical sequences, including A Lecturing Life, which I couldn’t have written had I not had one, and a poem in the voice of the explorer Colonel P.H.Fawcett, who disappeared in the Matto Grosso, Brazil, in 1929. There are picture postcard poems from a visit to Lanzarote, translations (and originals too) of some short pastoral idylls by Elina Baseilhac, a French newspaper reporter I met on the Ile de Ré, a group of poems about the materials out of which a city (Coventry) is made, and much more besides. Entry to the launch costs £3.00 which is redeemable against the cover price of The Age of Saturn (£14.95) if you buy a copy. Poetry ID are contributing to the 2015 Letchworth Festival with a reading at David’s Bookshop, Eastcheap, Letchworth Garden City SG6 3DE starting at 7.30 on Thursday 18 June. There will be a dozen different readers with poems ranging from the most serious to the most light-hearted in tone and subject matter. The evening is guaranteed to stimulate your imagination and enrich the fabric of your existence with an exchange of ideas, emotions and all the qualities that make life worthwhile. Tickets for the reading cost £3.00 and are you can buy yours from David’s Bookshop (01462 684631), from Letchworth Tourist In formation Centre, Station Road Letchworth SG6 3BB (01462 487868) or from Kim Simmonds-Hurn at Wild Roses, 61 Norton Way North, Letchworth SG6 1BH (01462 674956). Do come, and bring a friend. You’ll be very welcome! 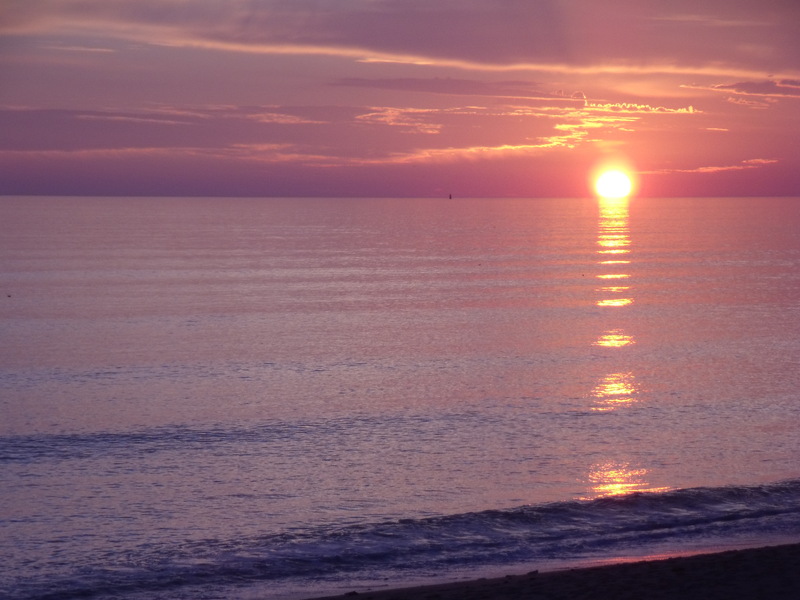 On the Ile de Ré this September there were several fabulous sunsets and I managed to film one of them from the beach at Les Grenettes from the moment the sun touched the horizon out at sea until its disappearance just over three and a half minutes later. 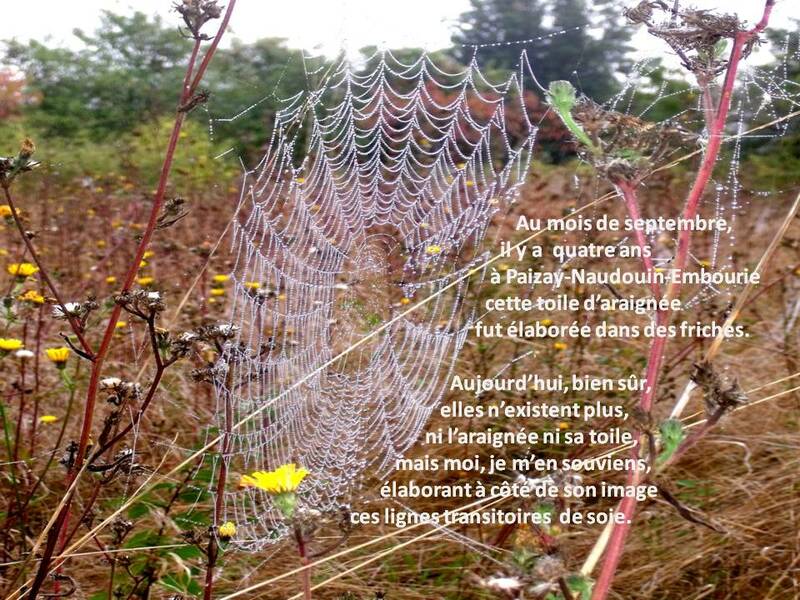 It’s a process that cannot but focus the imagination into a poignant realisation of both the beauty and the brevity of life, and the poem I wrote subsequently is the outcome of this realisation. My video now brings the film and the poem together, and I hope that for all its rough edges it expresses something greater than the sum of its parts. Letchworth Garden City Heritage Foundation are arranging an exciting autumn festival for the schools’ half term on the themes of Fire and Fright, and Poetry ID are delighted to be taking part. Four poets from the group – Rose Saliba, Barbara Wheeler, Clare Crossman and John Gohorry – will be offering free drop-in readings and workshops at the Festival’s special installation in Broadway Gardens. We will be on hand at the installation on Monday 27, Wednesday 29 & Friday 31 October, 10:00 to 12 noon and 16.30 to 19:00. The morning sessions will be aimed at families with children from 4 upwards, the afternoon/evening sessions at families with children from 7 upwards. With Diwali and Bonfire Night in mind, we will be exploring the character of fire, and thinking of Halloween we will also be looking at ghosts, ghouls and gremlins, along with whatever else makes our hair stand on end. Come and enjoy as many of the workshop sessions as you like. LGCHF will be putting together an anthology of writing produced in our workshops and in other creative venues during the festival, so you might find your work in print afterwards. Les Deux Magots is a restaurant in Paris much frequented in the 20th century by artists and writers, among them a group of existentialists led by Jean-Paul Sartre. The existentialists argued that people define themselves by the choices they make and the actions they carry out. 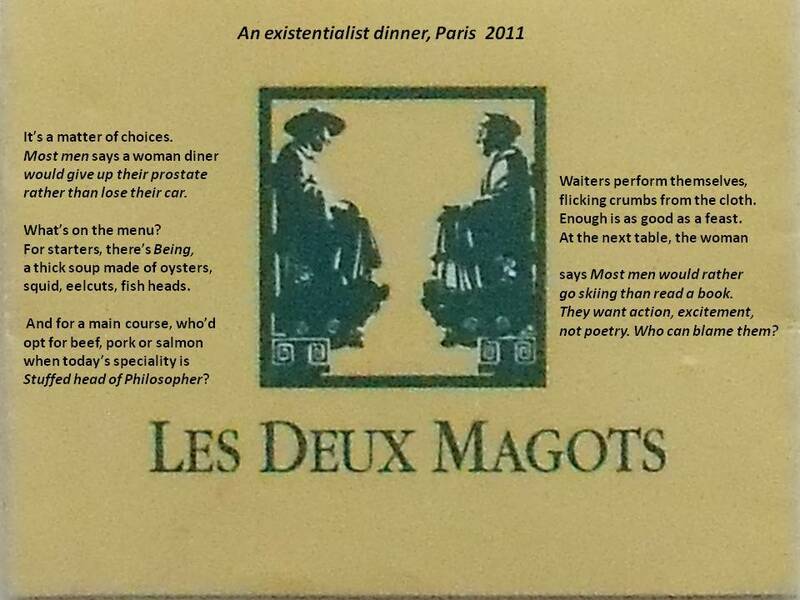 Dining in the restaurant in November 2011, it was clear to me that existentialism is still very much alive and kicking. Re-engaging with Lawrence Durrell’s ‘Alexandria Quartet’ recently has sent me back to exploring the poems of C.P. 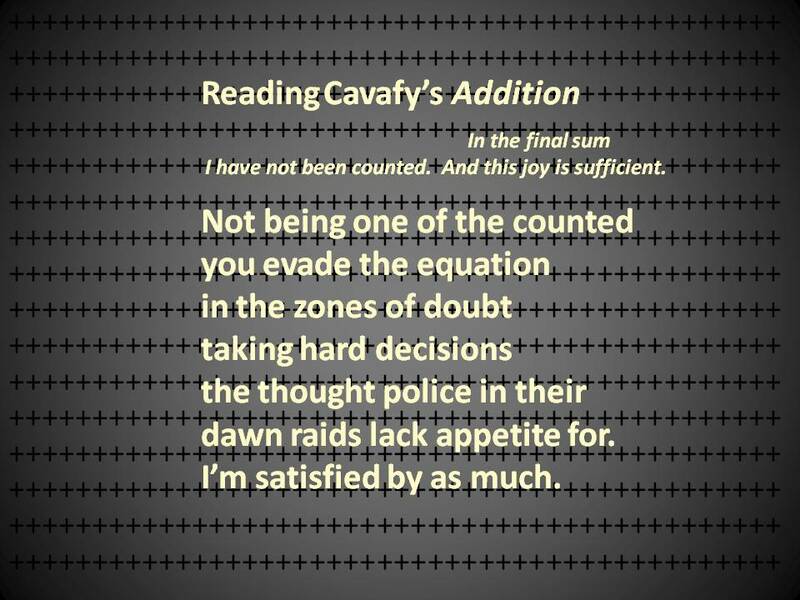 Cavafy. This is one of several image/poems I’ve written before and since our recent Cavafy workshop. I’m very pleased to announce that my poem The Apotheosis of Colonel P.H.Fawcett has won a prize in the 2013 flamingofeather poetry competition. Colonel Fawcett was an English explorer who disappeared in the Matto Grosso area of Brazil in 1925 while in search of an ancient city he referred to as ‘Z’. I first came across him when I was a boy reading Brazilian Adventure by Peter Fleming (brother of Ian Fleming). Peter Fleming set out to discover what happened to Fawcett but, along with other expeditions before and after, failed to do so. Years later, I read Expedition Fawcett, by one of Fawcett’s sons, which rounded out my understanding of the man. I wrote the poem earlier this year. An experimental collage, made after a visit to the Tate Britain ‘Schwitters in Britain’ exhibition earlier this week.